Give your kid’s room a timeless style while adding some storage space! this bed and headboard set is perfect for storing blankets and your little treasure’s clothes. It’s also easy to get into and the footprint is no bigger. Such a handy piece – who could pass it up? we like its versatile look, which blends easily with whatever might inspire you… and we guarantee you’ll like it as much as we do! bundle includes the bed and headboard. Economic choice: does not require a box spring. Features 3 open storage spaces. Reversible: the drawers can go on either side. Metal drawer slides. 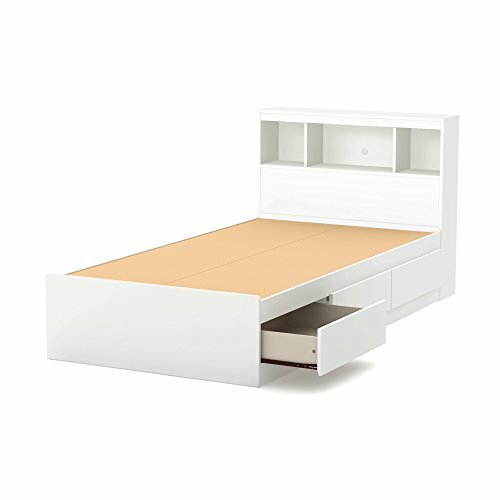 Bed: can support a total weight of up to 250 lb. Headboard: hole in the back panel for easy wire management. Meets or exceeds all North American safety standards. Mattress and accessories not included. Requires complete assembly by 2 adults (tools not included). 76.25'' (L) x 40.25'' (d) x 36.25'' (h). box Dimensions: 84.53'' (L) x 20.43'' (W) x 4.41'' (h), 108 lb. Box #2 Dimensions: 45.24'' (L) x 12.52'' (d) x 4.57'' (h), 37 lb. Ships in 2 boxes, make sure to have a friend with you. Packaging tested and certified to reduce the risk of damage during shipment. Made in North America with non-toxic laminated particleboard. 5-Year quality guarantee. Any questions? Contact the manufacturer, available 7/7 by phone, email or chat.